Until quite recently, radiopharmaceuticals have been confined to a very limited number of application in healthcare. However, in the last few years, medical research teams have started to unlock the huge potential of these compounds, both in the diagnostic and the therapeutic fields. Nuclear medicine, as it is also called, is becoming one of the most powerful tools in precision medicine. A radiopharmaceutical (or radiotracer) is a drug that consists of a radioisotope bonded to a pharmaceutical molecule. The pharmaceutical molecule conveys the radioisotope to specifically targeted organs, tissues or cells. It can be used in clinic for diagnosis, monitoring and therapy, or in research. 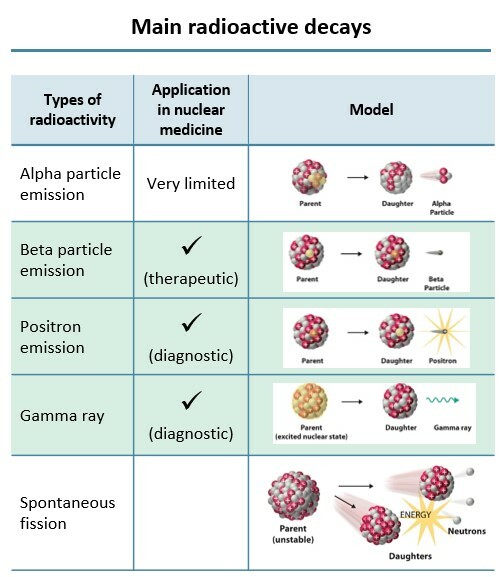 Out of a range of radioactive decays, there are three types of radioactive particles that are useful in nuclear medicine. For therapeutic purposes, the beta particle emission is used, and for diagnostic purposes, positron emissionand gamma rays are used. For diagnostic purposes, Positron Emission Tomography (PET) scans use radiopharmaceuticals which allow the imaging of organ function and disease states with a higher precision than other imaging modalities such as Computed Tomography (CT), Magnetic Resonance Imaging (MRI) and Ultrasonography (US). Radiopharmaceuticals permit the mapping of physiological function and metabolic activity of malfunctioning organs, as well as, the diagnosis of common cancers. With the precision of PET scans, these results are becoming the standard of care for cancer diagnosis. For monitoring purposes, there is increasing use of a radiopharmaceutical known as Fluorine-18 (18F) Fludeoxyglucose (FDG). FDG-18 is used in PET scans for both disease staging and treatment response assessment. With newer scanning techniques that have greater sensitivity and specificity, physicians can now conduct pre-treatment staging. These pre-treatment staging results can change therapeutic intent from curative to palliative, and place patients more accurately in the stages of their disease. Furthermore, simple quantitative results of glucose metabolism detected by the PET scan, can complement visual interpretation of the patient’s response to a drug. This can be used to determine whether to continue a treatment or to switch to another one. With an increasing availability of a wide range of radiopharmaceuticals to adapt to physicians’ needs, the use of radiopharmaceuticals is extensive and demands for such non-invasive techniques are on the rise. Fig. 2 – Eight men with widespread metastatic prostate cancer (red spots on image mark presence of tumours) who underwent treatment with radiopharmaceuticals. Each set of image shows the evident reduction of tumours before and after treatment. For therapeutic purposes, radiopharmaceuticals allow precision medicine where the treatment modality is tailored to a specific patient’s disease. For instance, to destroy cancerous cells, short-range particles like beta particle emissions are used to release a significant amount of energy resulting in tumour cell destruction. As damage is targeted, it reduces serious systemic side effects seen with chemotherapy. This property of radiopharmaceuticals can be further applied on pain treatment in palliative care for bone cancer or arthritis. Current trends in therapy with radiopharmaceuticals involve Peptide Receptor Radionuclide Therapy (PRRT) and Antibody Radionuclide Conjugate (ARC). PRRT targets highly expressed tumour receptors and is relatively safe due to rapid tissue penetration and body clearance. It has also low antigenicity and is convenient to manufacture. On the other hand, ARC targets highly expressed cancer cells surface antigens like CD20 and CD37 in Non-Hodgkin Lymphomas. Novartis’ recent acquisition of Advanced Accelerator Applications (AAA) for $3.9 billion USD for Lutathera (Lu-177), a radionuclide therapy for neuroendocrine tumours, affirms these trends. 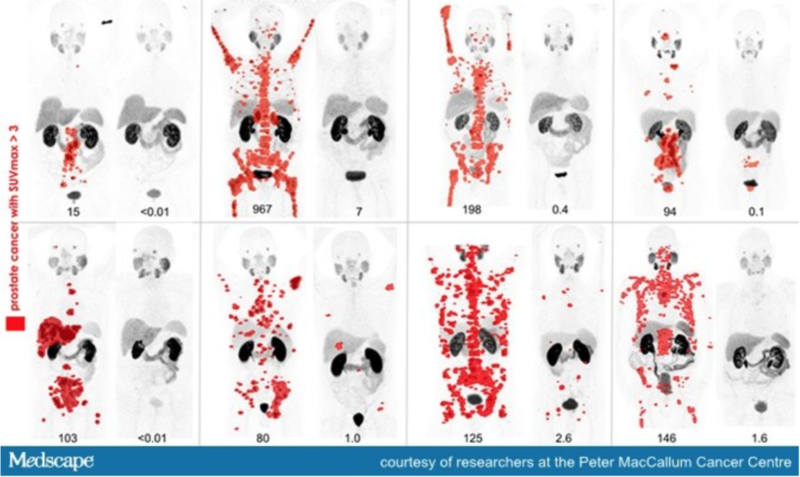 Although only a small portion of the radiopharmaceutical market, research is starting to embrace the abilities of PET scans too. Radiopharmaceuticals are increasingly used to improve efficiency and reduce the lead time of drug development. By using radio-imaging in Phase 0 (early phase) of a clinical trial, it gives a visualization of in vivo bio-distribution of the new drug in patients, thus realizing if the new drug hits required target organs. Without the need of invasive sampling, trials can easily identify and eliminate unlikely drug candidates and only proceed to the next phase with promising ones. With essential pharmacology data collected with radiopharmaceuticals in Phase 0, Phase I and II clinical trials could be combined into a Phase I/II trial. Successful patients in Phase 0 could be once again recruited, reducing number of new patients recruited and time needed for tests. Most impactfully, with a very well-selected group of patients in Phase I/II, the new drug would probably yield a highly positive result in this specific population. The new drug could then be put through an Expedited Approval (in US), thus skipping a full Phase III trial.